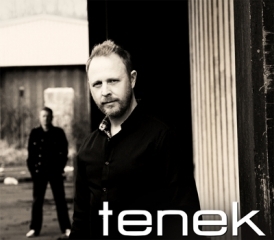 A new album, a new label, and helping to usher in a new wave of British synthpop and rock, Tenek’s Geoff Pinckney invites ReGen‘s readers through the Smoke and Mirrors of the band’s sound. 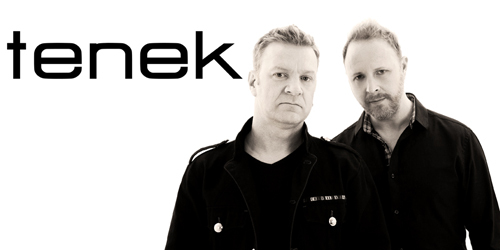 Founded in 2007 by Geoff Pinckney and Peter Steer, Tenek has steadily worked its way through the ranks of the synthpop world, bringing an organic and rather melodious approach to the genre. 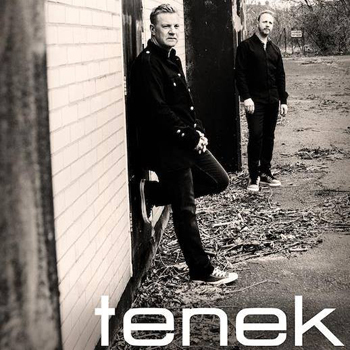 Blending the conventions of pop-based electronic with a more straightforward rock style, Tenek’s music reaches across genre lines and aims for a broader appeal that has made the band one of the most exciting in the current wave of British synhtpop. 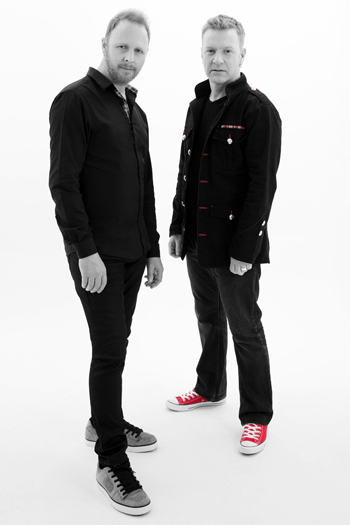 Over the course of three albums and nine EPs and singles, the band has toured and performed at numerous festivals throughout the UK and Europe, sharing the stage with the likes of Republica, Toyah, Assemblage 23, Front 242, The Human League, and A Flock of Seagulls. Now signed to Jim Semonik’s Dist0rtion Productions and with a new album, Smoke and Mirrors, Tenek is poised to take the world by storm. 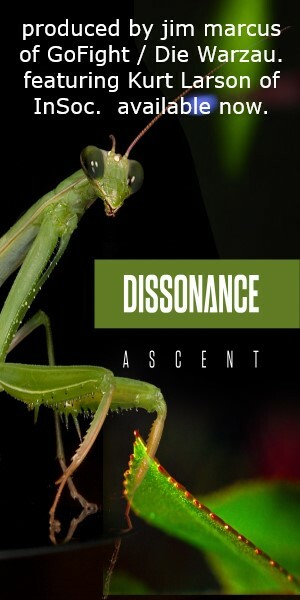 Geoff Pinckney speaks now with ReGen on the development of Smoke and Mirrors over the course of the last five years, the album format in the current music scene, the challenges in balancing electronic and organic instruments, and playing live. While Tenek has released several EPs and singles in the interim, Smoke and Mirrors seems to be Tenek’s first full-length album in five years. First of all, what can you tell us about the band’s productivity during this time and how it culminated in the material on the new album? 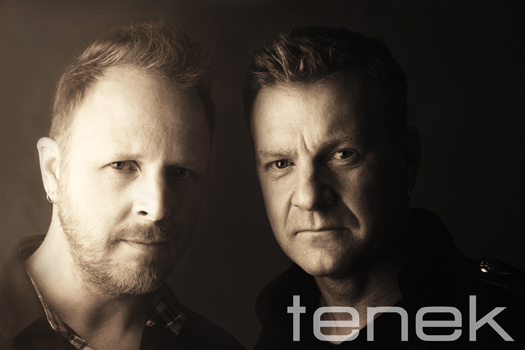 Pinckney: We took a while to find a direction that was a step up from the previous two albums but retained the elements that make the Tenek sound. Some songs were sketches that were worked on over a long period but others, like, ‘Soloman’ and ‘Imitation of Life’ came together quite late in the process and took less time to get to a point where we were happy with them. 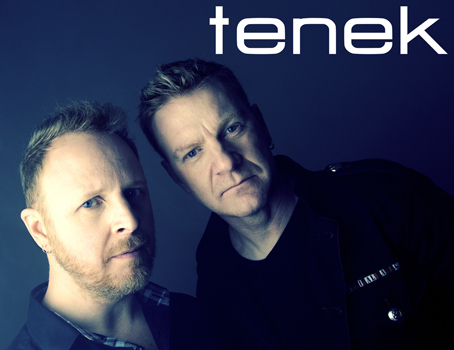 Ultimately, Tenek is about quality output and if it takes five years to make an album, that’s no problem for us. The EPs helped to bridge the gap and let people know we still existed while we were busy beavering away in the studio on the album. Secondly, there seems to be a greater emphasis for many artists in the electro scene on EPs, singles, and similarly shorter releases; what are your thoughts on the viability of the album format – both in regards to how you, Tenek, approach them and the audience’s response? Pinckney: We both prefer the album concept; it captures where the artist was creatively within a certain time period. Our audience shares that appreciation for the format and feels that having a physical product is better than a playlist on your computer – it’s a trophy! EPs are a great way of keeping the interest of the public and are obviously a lot quicker to put together than an album, a great way of keeping the momentum going and filling five year gaps in between albums! Smoke and Mirrors is your first album for Distortion Productions; tell us about how you came to associate with Mr. Semonik and his label and what motivated you to sign to his label? Pinckney: We’ve known Jim for many years and have contributed to his wonderful Electronic Saviors releases. We’ve always admired his motivation and enthusiasm for electronic music and it made sense to have him look after that side of the business for us. What are your thoughts on where the record label (as it has traditionally been perceived and defined) has yet to develop in the music business? Pinckney: It’s hard to say as yet. It’s still early days for us and Distortion, but I’m sure their enthusiasm and drive will take the label to a respectable level in the business. 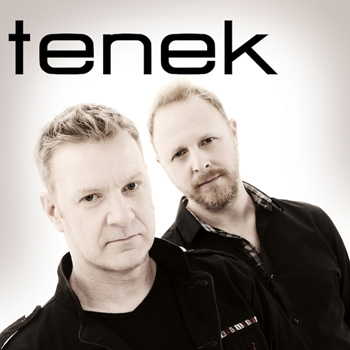 Tenek’s music, while rooted in electro-pop, does seem to emphasize melody (particularly in the emotive vocals) and organic instruments and tones. What do you find to be the most challenging aspects in bridging the electronic and organic elements together – both in terms of composition/songwriting and production? Pinckney: I may get to a point where I think, ‘Okay, that’s enough electronics; let’s introduce something more organic to give the song more depth and emotion.’ The main challenge for me is making the right choice of sound or idea without losing sight of where the song naturally wants to go. Every sound should have a purpose within the song, that’s very important. There’s an infinite palette of sound creation at my disposal, so it can be quite difficult for me to restrain myself and not get lost in hours of tweaking! On that note, there are several guest musicians, including three bass guitarists. First of all, how did Michael Steer, Paul Jackson, and Sam Morrison come to be involved on this album? Secondly, how did you find that their individual styles compared to each other’s to complement Tenek’s music (or in other words, why three different bassists instead of one)? Pinckney: It was a fun idea for us to get other musicians involved to add something extra, and on those occasions we felt that we wanted to get someone else to give it a go and see what they could do. It was a successful move as they all injected something of their own into the tracks. Michael Steer (Pete’s brother) had played live with us on several occasions. His contribution to ‘Fear for Nothing’ is what he used to play live to an early version of the track. We felt it really worked and brought an extra groove to the song so we got him to come to the studio to record it for the album version. Paul Jackson was put in touch with us via our PR manager, Cheri Freund. He liked our sound and was happy to contribute to one of the tracks. We felt ‘Smoke and Mirrors’ needed a fluid feel to the bass line and gave it to Paul to do his thing. He did a great job! Sam Morrison’s style really suited what we wanted for ‘Imitation of Life;’ it really drives the song along and has just the right amount attitude. Are there plans to take the music of Smoke and Mirrors live, and if so, what sorts of challenges does the new material present? Pinckney: We launched the album in November 2015 at the Garage in Islington, London. It was quite a change from our usual setup as we now had the inclusion of Steve Clark on drums. The onstage technology had to change to accommodate him, so the challenges are now more of a technical nature than actual performance. There’s a lot more going on these days onstage so it’s quite unnerving at times. You may not notice, but there’s at least one of the band members with his fingers crossed during the performance! Pinckney: We’re looking at releasing an EP at some point this year featuring exclusive material and there are other live shows in the pipeline. When the time is right we will reconvene in the studio to work on new material. I guess the new challenge for Tenek is to write an album within five years!